Crustaceans include crabs, lobsters, shrimp, krill, barnacles, and related species. There are approximately 40,000 crustacean species, the great majority of which are aquatic. Crustaceans are the only primarily aquatic group in the phylum Arthropoda, which also includes the insects and spiders. A few crustaceans, such as the familiar pillbug, have invaded terrestrial (land-based) habitats. Like other arthropods, crustaceans are characterized by a segmented body, jointed appendages, and an external skeleton that offers protection from predators. The external skeleton, called a cuticle, is made of chitin . The cuticle is periodically molted in order to allow for growth. The period after molting can be a dangerous one, because the new shell is still soft and affords little protection. There are nearly 5,000 crab species. Most are marine, although terrestrial species exist as well. Crabs have ten jointed appendages, including two large claws for food capture called chelipeds, and eight walking legs that are used for walking sideways. An elliptical carapace protects the rest of the body. Crabs have two stalked eyes and a pair of sensory antennae. Respiration occurs via gills, and special jointed mouthparts process food. Crabs have diverse diets: some are scavengers ; others are predators on clams and snails; and still others are herbivores , feeding on vegetation. The largest crab species reach sizes up to 3.7 meters (12 feet) across, including the legs. Crabs are an important seafood species. Two familiar crab groups are hermit crabs and fiddler crabs. Hermit crabs have the unique life history strategy of using discarded snail shells for protection. These crabs find new shells to inhabit as they grow. 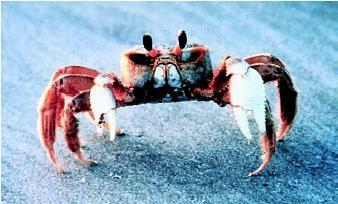 The ghost crab, native to the eastern United States, spends most of its life on land. Ghost crabs can be seen scurrying down to the water in order to wet their gills, which must be kept moist in order to breathe. 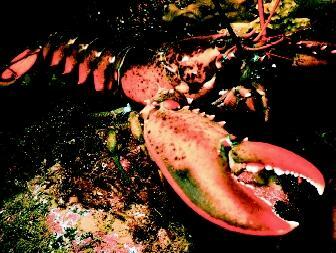 The lobster's large claw can crush crabs, clams, mussels, and human fingers. The largest lobster ever caught weighed 17 kilograms (37.4 pounds) and was 0.6 meters (2 feet) long. territories, intimidate other males, or attract females. These displays allow competition to be resolved without dangerous physical combat. Like crabs, lobsters have ten appendages, two claws and eight walking legs. A lobster can also snap its tail to propel itself quickly backward—this is most often used as an escape response when confronted with potential predators. Lobsters have compound, stalked eyes, chemosensory antennae, and sensory hairs on various parts of the body to detect touch and motion. The antennae are particularly sensitive, responding to environmental chemical cues regarding food, potential mates, and predators. Lobsters are predatory, and use their large claws to attack prey such as clams. The two claws of lobsters are adapted to different tasks—the crusher claw is used to break shells, whereas the ripper claw, which has finer teeth, is used to tear flesh. Legs and jointed mouthparts are used to manipulate prey items. There are both marine and fresh-water lobster species. The largest lobsters grow to lengths of 1.2 to 1.5 meters (4 to 5 feet) and may live over 100 years. Like crabs, lobsters are considered a delicacy and represent an important seafood species. Shrimp are small crustaceans that, like crabs and lobsters, have ten jointed legs. However, shrimp also have special swimmerets, small appendages along the abdomen, which enable them to swim. In addition, shrimp use sweeping motions of the tail to propel themselves backwards. Shrimp species are marine or fresh-water. The shrimp's chitinous external skeleton is thinner than that of crabs and lobsters and is shed as the animal grows. The largest species reach nearly 23 centimeters (9 inches). By weight, more shrimp are eaten by humans worldwide than any other crustacean. Barnacles are commonly seen attached to solid substrates such as piers, boats, or rocks, and are sometimes mistaken for mollusks because of their shells and sedentary lifestyle. Barnacles live in the high intertidal zone and filter small food particles from the water. Before they attach permanently to a substrate, barnacles go through a mobile larval stage. Larvae then attach head first and begin to secrete shells of chitin, which are expanded as they grow. These shells are kept closed when the tide is out in order to prevent drying out. When submerged, barnacles open their shells and filter-feed by waving their legs to capture plankton . Respiration occurs through gills on the legs. Many barnacles are hermaphrodites, producing both eggs and sperm. Krill are filter feeders that feed at night on the water surface. Their diet consists primarily of phytoplankton and algae. Like all crustaceans and arthropods, krill shed their exoskeleton over time. Unlike other crustaceans however, shedding is not always the result of growth—krill sometimes shrink in size, using their own body resources for metabolism during the long, dark Antarctic winter when food availability is low. The largest krill species attain lengths of up to 14 centimeters (5.5 inches). Krill are consumed by humans in some parts of the world. The horseshoe crab is not technically a crustacean—rather, it is an arthropod distantly related to spiders, which are arachnids. Horseshoe crabs have a large carapace and long tail. They eat clams and other invertebrates, crushing shells with their legs. Mating and egg-laying occur on beaches. Horseshoe crabs sometimes are described as "living fossils" because they do not appear to have evolved much in the last 400 million years. There are numerous species of aquatic insects and arachnids. Many insects play important roles in aquatic ecosystems, including as crucial elements of the food chain. For example, mayflies spend a lengthy larval period in the water, living either in the water column or in the muddy bottoms. Mayflies are detritivores (animals that feed on dead organic matter), and play an important role in breaking down nutrients. Dragonflies and damselflies are also found in aquatic habitats—their larvae are aquatic and highly predatory, capturing worms, small fish, and small amphibians. Insects such as mosquitoes are also characterized by an aquatic larval stage. Aquatic spiders feed on aquatic insects or small fish. 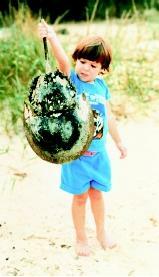 The shells (carapaces) of horseshoe crabs sometimes are found on beaches. If this were a live animal, picking it up by the tail could cause injury to the crab. Some aquatic spiders maintain an underwater air pocket to which they repeatedly transport fresh air. SEE ALSO Food from the Sea ; Mariculture ; Oceanography, Biological . The Lobster Conservancy. <http://www.lobsters.org> . * See "Ecology, Marine" for a photograph of a krill swarm. I would just like to point out that crabs have a total of 10 appendages, 3 pairs (6 legs) are used for walking, and are called walking legs. The very rear set of appendages are called their swimming leg and are not considered part of the walking legs.